If the project is being billed to a client, the project manager sets the billing rates for the project. The project manager creates tasks within the project and enters estimates. The project manager specifies which expenses can be claimed under the project. When entering time on their timesheet, users working on the project allocate their time against the project and task. Projects can contain many tasks and up to ten hierarchical levels. Every employee who is assigned to a project can create a task(s) for that particular project. An administrator can customize task add permission using Role Permission option available in Admin Options. Task is the main source of project time sheet. Time entry can only be entered into a task of any project. An administrator should create projects and define project manager and team leader of projects. Administrator or Project Manager or Team Lead can then define “Project Team”. Project Manager and Team Lead then can create project tasks and assign them to project team in order to allow employees to enter time entry for that task. Only user who is part of the project team can add a new task to a project. A task can be created using All Employee Task checked. All employee tasks appear in time entry of all team members of the project. A task can be created using All Project Task checked. 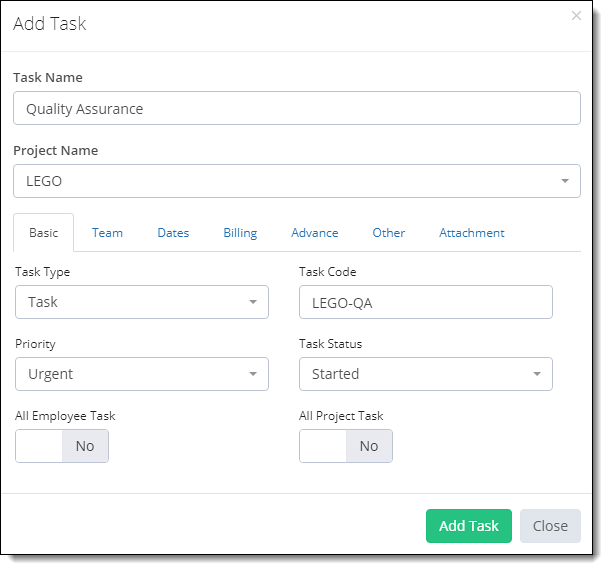 This task will appear in Task column with all projects (it will only visible to those employees who are the part of this task’s Project). A task can be created using both All Employee Task and All Project Task checked. Those tasks will be appearing for all projects and in all employees time entry. Every task has their own status, priority, completed %, completed fields to monitor task progress for team collaboration purpose. Every task has two fields Estimated Cost and Estimated Time spent for budgeting purpose. Project manager can categorize their project tasks in different milestones (phases) for easier monitoring of individual milestones (phases) and then at project’s root level. A task can be viewed through these four different options. My Task (the only task which is assigned to the logged-in employee). Projects > Tasks (Hierarchical view of all task for administration purpose). The administrator can add, edit and delete any task from there. Click on My Task icon from the left-side menu. Click on +Add Task green button to add task. Select the Project Name from the drop-down list. (Note: If any project is not in the list, logged-in user is not in that Project team). Select Task Type (category of task. It depends upon usage to usage of TimeLive in different environments. Administrator can create new task types as per their organizational needs from Admin options > Task Types). Check All Employee Task (Check this field, if you want this task to have appeared in time entry of all employee. General routine tasks for which you don’t want to add in all projects). Check All Project Task (Check this field, if you want this task to have appeared in time entry of all projects. General routine tasks for which you don’t want to add in all project)%(color-red)(it will only visible to those employees who are the part of this task’s Project)%. Select the Employees’ names who should be the team members of this task. Select the Billable Switch (if you want this Task hours to be billed to the client). Select Billing Rate Start Date. Select Billing Rate End Date. Select Milestone (Project manager can categorize their project tasks in different milestones i.e. phases for easier monitoring of individual milestones (phases) and then at project’s root level). Select Switch Parent Task (check this field, if you want this field to be added as parent field. This field will then come in parent task dropdown during task add). Select Completed (This option is discussed below). Select any File for attachment which is associated with this Task if required. Click Add Task green button to add this Task. A logged-in employee can modify any task by clicking on any task in My task task list. An employee can update task title, task comments, task status, completed, completed % in task modification form. Scroll to the task which needs to be changed. Click on the Options gear icon against the task. Make the changes in the required field(s) then click Update Task. When a task is completed, there are two ways to complete it in the system. Complete the Project Milestone and all the tasks which are created under it will automatically be completed. Complete the Parent Task and all its Sub-Tasks will be completed automatically. Edit the Task, Navigate to Other Tab, Change the Completed switch to Yes and click Update Task. Scroll to the task which needs to be deleted. Task Comments are the history of comments from different task related users in order to communicate different issues/updates/comments for that particular task within the team. Task comments cannot be deleted once it entered. In task comment form, enter comments title and comment description. Click on Add to add that task comments.